The electrostatic potential surfaces of the initial product of the oxidative one-electron transfer, 1*+, are shown in Figure 7. Surprisingly, an almost symmetric structure with a planarized cyclobutane ring is obtained at the UHF/6-31G* and the Becke3LYP/6-31G* levels of theory. Whereas for neutral cyclobutane, the planar ring corresponds to a transition structure for ring inversion, the harmonic frequency analysis identifies the structure shown in Figures 7 and 8 as minima on the potential hypersurface. This geometry is presumably due to the fact that the alignment of the two pi-systems leads to a better stabilization of the radical cationic character. 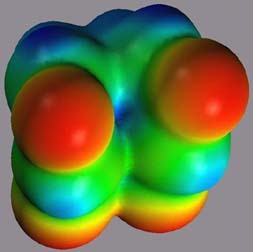 The quasi-symmetrical geometric structure of 1*+ is also reflected in a symmetrical electronic structure with almost identical charge patterns in the two pyrimidine rings, as can be seen in Figure 7. The cationic character is virtually localized in the N1-N6/N1'-C6' bond, resulting in a stabilization of the positive charge as an imminium ion. Analogous to the electrostatic potential, the spin density in 1*+ is also equally distributed between the two ring systems, but localized at C6/C6'. 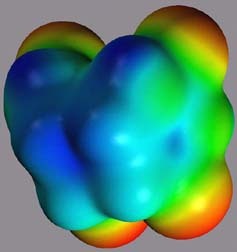 The overall topology of the singly occupied molecular orbital (SOMO), shown in Figure 8 right, is in good agreement with the HOMO of 1 and the quasi-symmetry of 1*+. 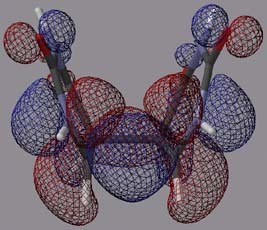 It can also be seen that, like the radical cation of the cyclobutane thymine dimer, the C6-C6' bond is stretched. 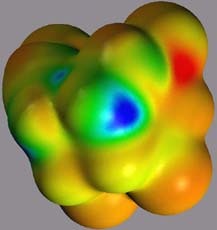 Nevertheless, the SOMO has still substantial electron density between these two centers. It can be estimated that the activation energy for complete disruption of this partial bond upon rotation of the pyrimidine rings relative to each other will be very low.